In 1854 Lutheran worship services in Red Bud began in a log school house located on the Guebert farm west of town and just south of what is now Highway 3. Pastor F. Erdmann of the Trinity congregation provided pastoral care for five years. On April 15, 1855 St. John’s Evangelical Lutheran Church of Red Bud was organized. Services were held in the new public school in Red Bud. In 1856 an acre of land was donated and two more were purchased in the southern part of Red Bud. In 1857 a church building was erected at a cost of $1,500. On the Sunday of its dedication services were held in both German and English languages. On the recommendation of Dr. C.F.W. Walther of Concordia Seminary in St. Louis, Rev. 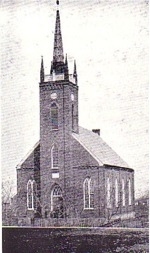 Frederick Schaller was installed as St. John’s first resident pastor on December 4, 1859. He served for 31 years until his death. He had a special gift of preaching God’s Word with simplicity. He also taught the school children for several years. The congregation consisted of 26 voting members who adopted a constitution in 1860. They also passed a resolution to eliminate the congregation’s debt. The families were divided into three groups ($20, $15, $10) according to their ability to pay. Despite the hardships of the nation’s Civil War, an organ was purchased in 1863 for $261. The congregation also was led in singing by strong-voiced men called “Vorsaenger.” That year the financial report noted income of $636.57 and expenses of $1002.87. Thus the congregation carried a debt of $366 into 1864. Yet the congregation built its first parsonage that year, a brick house that cost $1,800. In 1864 Mr. A.C. Burgdorf became the first regular teacher at St. John’s. He stayed only one year. The first Board of Education was George Goedelmann, William Guebert, and Henry Kloepper. On April 15, 1865 St. John’s celebrated its tenth anniversary on a day of national sorrow. President Abraham Lincoln, a resident of Illinois, died that morning as a result of a gunshot the previous night. This occurred just days after the end of the Civil War. Under God’s grace, St. John’s experienced steady growth, so much so that the first church building became too small. The congregation decided to build a new structure. Rev. Martin Stephan, Jr., the son of the deposed leader of the Saxon immigrants of twenty years earlier, was the pastor of St. John in Chester. He had studied church architecture in Germany so he was asked to design the building including a fine steeple. Carl Rathert was hired as carpenter and Henry Kloepper did the masonry work. All members who did not have the heavy equipment of that time (a team of horses and a wagon to carry freight) were expected to help dig (by hand) the foundation. The cornerstone was laid in June 1867. It was dedicated in April of 1868. Two bells were purchased, weighing about 1600 pounds with the tones of F and A. The building cost about $12,000. Those who did not pay their pledges on time were asked to sign a note carrying a 10% interest charge! A janitor was hired at $40 a year. In 1868 St. John’s joined The Lutheran Church—Missouri Synod. The first baptism in the new sanctuary was on Dedication Sunday. It was of Engel Christina Guebert. She was still a member of St. John’s when the congregation celebrated its 100th anniversary. The first wedding was of Louis Pelzer and Catherine Parrott. The first funeral was that of Anna Rabeneck. An attempt had been made at school tuition in 1864. The cost was 50 cents a month for each child. Quoting from the 100th anniversary book: “This arrangement did not prove satisfactory.” The congregation then assumed the entire support of the school. The school teacher from 1866 to 1871 was Mr. L. Deffner. Miss Bertha Diercks was hired at $25 a month to be the second teacher. She could not maintain discipline in the classroom and was given a leave of absence by the congregation to devise a way of restoring order in the classroom. Three other teachers served only one year during this decade. Each one was assisted by student teachers. Early school picnics were major events in the congregation. They began with a parade with marshals on horseback. Coffee, beer and lemonade were served. The children were given lemonade free. The adults had to pay five cents a glass. The picnic in 1868 made a profit of a little more than $20. In 1875 the congregational operating debt was $3,353. Once again, the leaders decided to assess each member according to his ability to pay. This was to be done by a committee and accepted by the individual. The 100th anniversary booklet says very matter of factly, “The plan did not produce the desired results.” Finally, William Guebert offered to assume the congregation’s debt if the assessments of the individuals were made payable to him. If he collected more than the amount of the debt, the balance would go into the congregation’s treasury. If he could not collect the full amount, he would absorb the cost himself. His offer was unanimously approved! In 1875 Mr. J.F. Holtmann of St. Louis accepted the call to be the teacher of St. John’s school. He faithfully served for 26 years. That same year the first teacher’s house was built east of the school building. It was just north of the current garage behind the church. During his time the enrollment of the school reached 100 and more. In 1881 a second teacher was hired, but Mr. C. Moll was released after only a few months due to a lack of money in the school fund. Following the completion of the new church building in 1868, the old wood frame building was converted into a school house. It was torn down in 1880 and on the same foundation a new two-story brick school house was built at a cost of $1,500. It was located just north of the church building on the open lot of what is now the corner of Bloom Street and E. S. 4th Street. It was used as our school until 1922. Stones from that building site still can be seen in the ground. Pastor Frederick Schaller served St. John’s from December of 1859 until his death in 1890. The congregation was so appreciative of his ministry that they had presented him a gold watch for his 25th anniversary at St. John’s in 1884. Pastor H. Lenk replaced Pastor Schaller in 1891. He was a native of Germany and came to St. John’s recommended by a professor at Concordia Seminary in St. Louis. Though he was a capable minister, he had difficulty adjusting to American social conditions. Two of his children died while he was in Red Bud. He resigned in January of 1892 in order to return to Germany. Red Bud was struck with a tornado in 1892. While the city suffered much damage, St. John’s church building only had minor roof and steeple damage while the parsonage and teacherage were untouched. Also in that year the Ladies Aid was organized. There are no records of its early history. In 1893 side balconies were added in the sanctuary. This increased the seating capacity of the building considerably. In 1895 the steeple was rebuilt to a height of 140 feet at a cost of $2,000. In 1894 Mrs. Caroline Voelker was hired as a second teacher to assist Mr. J. F. Holtman with the many students enrolled in the school. She was released after one year due to lack of money received from tuition fees. In 1897 the brick parsonage that had been built in 1864 was torn down. It was replaced by a wood frame house on the south side of the church building. The rest of the area was a cow pasture. This house served as the pastor’s residence until 1945. After that it was used as a teacherage until it was torn down in 2000 to make room for our current Fellowship Hall. “It was the perfect house for our family,” says former St. John’s principal, Mr. Ron Snyder. In 1901 Pastor George Link accepted a call to be the assistant pastor for his son in La Porte, Indiana. He left after nine years of service at St. John’s. The congregation then called Rev. J.H. Hartenberger of Paducah, Kentucky to be its next pastor. He had graduated from Concordia Seminary in Springfield, Illinois in 1893. He first served a dual parish in Arkansas. He would serve as St. John’s pastor for 36 years. His service to the church continued by way of sons who served as pastors and daughters who married pastors. Pastor Hartenberger is described this way in the 100th anniversary book: “He was a faithful preacher, a true shepherd of his flock and a leader in the church. He gave diligent attention to the preparation of his sermons and to the care of the sick and needy.” During his pastorate the use of the English language in the worship services increased. Under the Lord’s blessing the congregation prospered, growing both numerically and spiritually. In 1901 Teacher Holtman resigned after 26 years of service. In December Mr. F. Sassmanshausen was installed as teacher. He was assisted first that year by Miss Elizabeth Roesener, the next year by Mrs. Caroline Voelker, and then in 1903 by Miss Adela Heumann who served St. John’s until 1930. In 1902 a fine pipe organ made by Kilgen and Son of St. Louis, was installed at a cost of $1800 (the same amount it had cost to build the first parsonage in 1864). The Ladies Aid later paid for a blower that cost $225. In 1904 the first electric lights were installed in the church building. In 1905, on the occasion of the congregation’s 50th anniversary, 43 members of St. John’s purchased the art glass windows in the church at a cost of $700. Rev. Hartenberger was St. John’s pastor throughout this decade. In the summer of 1914 war broke out in Europe. As the war progressed, German-speaking Lutherans in America would be looked upon with suspicion by their English-speaking neighbors. In 1910 four ladies organized the Mission Society. Their first project was to sew for the needs of our synod’s India Mission. They operated informally until adopting a constitution in 1919. Mr. F. Sassmanshausen served as the teacher in St. John’s school until 1908. After he left, a student named Titus Lang filled the vacancy until Mr. A.C. Stellhorn was installed in August of 1908. A native of the Prairie area, Mr. Stellhorn served at St. John’s until October of 1911. He later served The Lutheran Church-Missouri Synod as the Secretary of Schools. Later in his life the degree of Doctor of Education was conferred upon him. Student Paul Schuss filled the teaching vacancy after Mr. Stellhorn left. In November of 1911 Mr. A.L. Persson was installed as St. John’s teacher. He came from Pleasant Ridge (Maryville), Illinois. He would serve St. John’s for 37 years until his retirement in 1948. In 1913 our school was expanded to include the 7th grade. On May 7, 1915, less than a year after World War I (1914-18) erupted across Europe and less than a month after St. John’s celebrated its 60th anniversary, a German U-boat torpedoed the Lusitania, a British ocean liner en route from New York to Liverpool, England. More than 1,100 of the 1,900 passengers and crew members on board perished, including over 120 Americans. Nearly two years would pass before the United States formally entered World War I, but the sinking of the Lusitania played a significant role in turning public opinion against Germany, both in the United States and abroad. It also created anti-German sentiment directed against people who spoke, worshipped and taught in the German language. St. John’s members, however, displayed their American patriotism by purchasing $90,000 worth of Liberty Bonds during the ensuing Great War. The first collection for the Red Cross in Red Bud was raised by our congregation. In 1918 the congregation celebrated Pastor Hartenberger’s 25th anniversary in the ministry. He was St. John’s pastor throughout this decade. Mr. A.L. Persson was the principal during this time. Miss Adela Heumann served with him as a teacher. In 1922 the eighth grade was added. In 1922 St. John’s purchased an acre of land two blocks south of the church. Mr. and Mrs. Henry Guebert added another acre to it. On this property a new, two-story, brick school building was built at a cost of $22,000. Building Committee members were Henry Burgdorf, George Koch, Louis Schrieber, Louis Roesemeier, and Louis Liefer. It was built by F.A. Neuhaus and Paul Loesche. The building was dedicated in October of 1922. The Senior Walther League was organized on October 8, 1920. This group served the young adults of St. John’s. In 1924 St. John’s hosted for the first time the Southern Illinois District Delegate Convention. 175 guests from throughout the district were easily and comfortably taken care of for a week in Red Bud. This decade of the congregation’s history witnessed some anniversary celebrations. In 1926 St. John’s observed Rev. Hartenberger’s 25 years as its pastor by giving him money that he could use for the purchase of a new car. In preparation for its 75th anniversary, St. John’s decided to redecorate the church building. A total of $5000 was spent with support of the various organizations of the congregation. The rededication service was held on the Sunday after Easter in 1929. Before the congregation could observe its anniversary, the nation experienced a stock market crash in October of 1929 throwing the country into The Great Depression. On April 27, 1930 St. John’s celebrated its diamond jubilee. A morning service was conducted in the German language with Rev. J. Kleinhans of Staunton, President of the Southern Illinois District, preaching. Services also were held in the English language with Professor W. Behrens of the Springfield seminary preaching in the afternoon and Rev. John Fritz, Dean of Students at the St. Louis seminary, preaching in the evening. At the time services on Sunday mornings were conducted in both the German and English languages. The Men’s Club was organized in September of 1932 with sixteen members. It became affiliated as a charter member of the Lutheran Laymen’s League. Its first officers were A.G. Sommerfeldt, A.F. Guebert, Otto Ackermann and Alfred Burgdorf. As St. John’s entered its ninth decade, the nation remained stuck in the economic doldrums of the Great Depression. A different kind of depression struck the congregation when its long-time pastor, Rev. Hartenberger, died on February 26, 1937. Funeral sermons were delivered in German by Rev. C. Thomas Spitz, President of the Southern Illinois District, and in English by Dr. Walter A Maier, Concordia Seminary professor and later known as the first Speaker of The Lutheran Hour. Rev. Hartenberger is buried in our cemetery. During this decade our nation experienced the attack on Pearl Harbor, Hawaii, on December 7, 1941. This brought our country into the wars being fought in Europe and the Pacific. Young people of our congregation faithfully served in our nation’s military. As this decade of our congregation’s history ended, the defeat of Germany was close but there seemed to be no end in sight in the war with Japan. In the fall of 1944 a third classroom was opened on the upper floor of the school building. Mrs. Ella Schrieber was hired to teach grades one and two. Mr. Sommerfeldt then taught grades three to five (as well as being organist and choir director) and Mr. Persson served as principal and taught grades six to eight. St. John’s entered its tenth decade with the war in Europe coming to a close. Soon Germany surrendered. The nation celebrated V-E Day. The joy was tempered by the ongoing conflict in the Pacific. Allied troops faced the prospect of bloody battles if they invaded the main island of Japan. Early in August, the dropping of two atomic bombs on major Japanese cities led to that nation’s unconditional surrender. Red Bud joined in our nation’s celebration of the end of World War II. Soldiers who had fought bravely on both fronts of the war were welcomed home as heroes. They were ready to get on with their lives by being active in church and community. In 1945 St. John’s built a new parsonage for the pastor’s family dwelling. It was located on the west side of Highway 3 across from the school. It cost $15,000. That year St. John’s celebrated its 90th anniversary with guest speakers Rev. C. Thomas Spitz, President of the Southern Illinois District, and Dr. J.W. Behnken, President of the LCMS. In 1950 the congregation experienced the illness and subsequent death by heart attack of Pastor Eisele on June 24, 1950. He died while on leave in Indianapolis, Indiana. His funeral service and burial were held there. A large number of St. John’s members attended. On April 1, 1951, Rev. M.H. Gross of Reeseville, Wisconsin, was installed as St. John’s next pastor. Despite the loss of their shepherd, the congregation continued with plans to remodel and enlarge the church building. During this time services were held in the Red Bud Public School Gymnasium (now Birke’s Garage on East Market Street) for 11 months. The building was lengthened by 47 feet to the east. It included two new entrances on the south, a pastor’s study off of the chancel, and a new basement. The side balconies were removed and the main balcony extended by 11 feet. The building was furnished with new items including a two-manual organ. Arthur Gielow was the chairman of the building committee. Charles Braun was the contractor. The cost of the project was $152,000. It was dedicated on May 11, 1952 with four special worship services led by guest preachers. The Evening Guild was organized on Nov. 18, 1952 with 28 members. Their object was to encourage fellowship among the ladies and to engage in mission work whenever possible. Original members still with the Guild are Norma Vogt, Nina Guebert, Dorothy Papenberg, and Olivia Schmitz. Mr. Sommerfeldt replaced Mr. Persson as principal in 1948. Others who taught in our school during this decade were Miss Ruth Hanebutt, Miss Neva Luebkemann (now Mrs. Omer Liefer), Mr. Karl Eisele, Jr., Miss Evelyn Guebert (now Mrs. Vernon Muench), Mr. Edward Lochmoeller, Miss Carol Seager, Miss Jo Ann Schaefer, and Mrs. Odis Stellhorn. In 1954 a fourth classroom was added to the school with an enrollment of 127. St. John’s celebrated its 100th Anniversary on April 17, 1955. Professor Arnold Guebert preached a morning German service and Professor Alex Guebert preached an English morning service. Dr. H. Harms preached for the afternoon service. Rev. Martin Hartenberger preached the evening service. Rev. M.H. Gross served St. John’s as pastor throughout this decade. St. John’s hosted the Walther League District convention in September of 1955. Mr. Paul Simon (later U.S. Senator) presided. Over 350 people attended the banquet. It was held here again in September of 1963. The congregation also hosted the Southern Illinois District convention in June of 1964. In January of 1956 Vernon Muench became the congregation’s first Sunday School Superintendent. In July of 1958 the church parking lot was constructed. In 1964 the congregation voted to discontinue all German services. Sunday School and Bible Class enrollment that year was 213, taught by 37 volunteer teachers! Little did the congregation know that an act on August 28, 1955 would influence the congregation’s ministry for the next 50 years. Mr. Ron Snyder, a recent graduate of Concordia Teachers College in River Forest, Illinois, was installed that day and has served the Lord and St. John’s ever since as classroom teacher, principal, musician, Bible class leader, coach and readily available substitute teacher in his retirement. Under his direction the school yearbook, the “Discipulog,” began in 1962. Mr. Walter Prothe of Paola, Kansas, came to St. John’s as school principal, organist and choir director in March of 1957. He died the day after Christmas in 1960. Others who taught at St. John’s during this decade were Mr. and Mrs. Cliff Lochhaas, Miss Elma Bok, Mrs. Odes Stellhorn, Mrs. Henry Kuring, Mr. Donald Kalthoff, Mrs. Carl Behnken, Mr. Bruce Gutknecht, Mrs. Lester Kirsch, Mr. Edwin Klohr, Mr. Howard Holschen, Mr. William Tetting, Mr. Samuel Johnson, Mr. Theodore Hartmann, and Mrs. Edgar Meier. Planning began for a new school building with Ralph Wehrenberg (Building) and Victor Guebert (Finance) as committee chairmen. 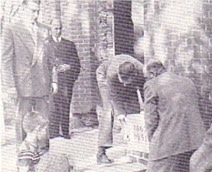 Ground was broken on April 17, 1960. The building was dedicated on Pentecost Sunday, May 21, 1961. Charles Braun of Red Bud was the contractor. It had six classrooms, gym, kitchen, offices and cafeteria. This facility cost almost $230,000. A tract of land was donated by the Oliver Ratz family. St. John’s observed its 110th anniversary by redecorating the church interior and installing a public address system with wireless microphones. An Estate Fund Committee was established in 1965 to administer funds given initially by the Edward and Margaretha Guebert will. That year, almost six acres of land from that estate was purchased to increase the size of our cemetery. In 1966 and again in 1974 acres of land from the Guebert estate were sold by the congregation to the Red Bud School District. In 1975 19 acres were sold to the City of Red Bud for park purposes. Having been St. John’s pastor since 1951, Rev. M.H. Gross ended his service here on January 1, 1967. Rev. Robert Holstein of Grand Forks, North Dakota, was called and installed on April 2, 1967. In 1972, Wayne Jensen became St. John’s first vicar. These are seminary students who do a one-year internship in a congregation under the supervision of a veteran pastor. He was followed by Paul Preisinger in 1973 and Mark Scheve in 1974. In 1975 the congregation, along with the Kenneth Voges family, sponsored a Vietnamese refuge family living in Red Bud. Already in January of 1968 it was recognized that the 1961 school building was not large enough to serve the number of children in the school. After two years of study, a Building Committee (Dr. R. E. Schettler, chairman) and a Finance Committee (Carl Zschiegner, chairman) were formed. A contribution from Oliver Ratz, Sr. made it possible to purchase additional property for the school. On June 25, 1970 a bid of $96,899 was accepted. The four new classrooms were dedicated on May 30, 1971. Building debt was paid off in April of 1974. Also in that year St. John’s Men’s Club erected a utility building on the school grounds. Mr. Ronald Snyder continued his service to St. John’s as principal and classroom teacher during this decade. Others who served as teachers during this time include James Rhiver (1965-1972), William Tetting, Isabelle Stellhorn, Pearl Rhiver, Erna Kuring, Vera Laufer, John Wiatr, Daniel Werning (1971-1974), Eunice Wiatr, Kathy Werning, David Polnick, and William Boss. In January of 1967 Mary Gross began her long and faithful career as St. John’s church and school secretary. In 1975 Mrs. Isabelle Stellhorn’s retirement was observed with a farewell party. What began as a temporary position turned out to be 21 years of dedicated service to the children of St. John’s Lutheran School. Funding for ministry is a continual need for every Christian congregation. In October of 1978 St. John’s held a debt-elimination Sunday. Donations were matched by funds from the Estate Fund. Over the next six months enough money was contributed to free the congregation of debt (for a time!). In 1980 the garage behind the church was built. With volunteer labor the project was completed for only the $6,300 of material cost. At about this time, members of St. John’s and Trinity-Prairie, under the leadership of Mrs. Elsa Saxenmeyer, began weekly visits to the nursing home in Red Bud for sing-a-longs. Pastor Robert Holstein ended his service at St. John’s in January of 1981. Rev. Arnold Schneider, a retired missionary and member of the congregation, served as the vacancy pastor. Rev. Donald Schultz, most recently of Altamont, Illinois, was installed as St. John’s pastor on August 9, 1981. To meet as many members as quickly as possible, he held a number of member meeting called, “Night With the Pastor.” In 1982 it was decided to celebrate Holy Communion twice a month in both Sunday services. A debt reduction drive again was held enabling the congregation to be free of debt (for a time!). The Board of Elders worked with Pastor Schultz on a Shepherding Plan to visit members who had not been in worship. In 1983 the number of Elders was increased from five to nine. A Junior High youth group was organized. The Senior Youth attended the LCMS Youth Gathering in San Antonio. Mr. Emil Junge and Mr. Henry Rahn retired as chuch custodians, serving after Mr. Ed Renner. Mr. Alvin Buch took over the custodian duties. A Handbell Choir was formed in 1984 with the purchase of three octaves of bells. In January of 1985 the Voters’ Assembly resolved to include women as voting members. Vicars during this decade were Joe Lecke, Donald Wilke, Paul Schunemann, Daniel Weiss, Jack Davidson, Robert Wagner, James Kerner, Mike Maddick, and Mark Schulz. Those who taught in St. John’s school during this decade were Ron Snyder (principal), Ted Boettcher (music), Christina Braunschweig, Vera Laufer, Valeda Tegtmeyer, Larry Grass, William Boss, Diane (Schalm) Boss, Karen Boettcher, Lynn (Koenig) Langrehr, Luann Larabee, Steve Dressler, Margie Morgan, David Ingwersen (youth), and Lucy Mickow. Mrs. Deitt Schneider began her long service to St. John’s in 1983. The graduating class of 1983 was the first to take an extended educational trip, enjoying three days at the World’s Fair in Knoxville, Tennessee. In 1983-84 a concerted effort was made to invite sister congregations who had closed their schools to send their students to St. John’s for a tuition of $600. Two computers were purchased for classrooms. Enrollment stood at 143 students in 1985. Rev. Donald Schultz served as St. John’s pastor throughout this decade. Vicars during these years were Gary Sears, Richard Lohmeyer, Bill Dorow, Randal Schlak, James Greer, Gary Osburn, Robert Gentet, John Deitz, Paul Willweber, and Peter Hentfling. Lisa Kloepper and Mary Gross served as office secretaries during this time. Once again, the year 1985 saw a debt reduction drive to bring the church treasury into a positive balance. In 1986 a wheelchair ramp and door were added to the church. In 1987 youth began serving as acolytes and adults started welcoming people to worship as greeters. Video-taping of worship services began. In 1988 a “Time of Your Life” program was held to eliminate the congregation’s $115,000 debt. Lutheran Worship hymnals were added to the pews along with The Lutheran Hymnal for a two-year trial basis. In 1992 the church building was air-conditioned and remodeled thanks to a large bequest from the estate of Roger Hecht. That fall the congregation decided to tear down the north teacherage. At that time the Ladies Aid disbanded after 100 years of existence. In 1993 the stone markers were erected at the cemetery entrance in memory of Arthur Gielow from his family. That summer congregation members were very involved in area flood relief. High school youth attended LCMS youth gatherings in 1986 (Washington DC), 1989 (Denver), and 1992 (New Orleans). Alvin Buch resigned as church custodian in the summer of 1989. Pat Stellhorn volunteered until Glenn and Denise Guebert were hired in January 1990. Ken Williams began helping them soon after that. In April 1988 a “Raise the Roof” auction raised $18,200 to help pay for roof, furnace and gas line repairs at school. Ron Snyder served as school principal through the 1988-89 school year. In June of 1989 a school alumni reunion was held with a recognition program for him along with meals and special services. William Lubben was school principal from 1989-1992. Deitt Schneider began her service as principal in the fall of 1992. In 1991 student Ted Wiatr won local and state geography contests and competed in the National Geography Bee in Washington, DC. The Preschool program began in 1993 with Faith Mueller and Cindy Steele as teachers. Kindergarten began in the fall of 1994 with Betty Schield (now Schmitz) as the first teacher. Other teachers who served during this decade were David Ingwersen, Luann Larabee, Deborah Wolff, Kevin Garbers, Vera Paulter, Karen Boettcher, Lynn Langrehr, Ted Boettcher, James Pieper, Meg Gross, Andrea Schlak, Dorothea Eckert, Rodney Eckert, Ron Schield (music), Karen Perr, Rachel Snyder (now Miller), Lori Deitz, David Lucht, Sonja Gulbrandsen, Terri Reed, and Susan Murphey. The school custodian was Robert Kaestner. The cooks were Malinda Koester and Viola Muench. Rev. Donald Schultz began this decade as St. John’s pastor. In 1996 his 35 years of pastoral ministry were celebrated. Vicars who served during these years were David Byler, Garry McCracken, Rory Seeger and Scott Perry. They lived in the teacherage on the south side of the church. In 1997 the congregation sold 26 acres of land to the Red Bud School District and Belleville Area College. In that year a debt reduction drive was held to eliminate the congregation’s debt. In 1998 a Lutheran High School Association was formed and St. John’s became a member of it. In 1999 a Mission View Committee was formed to establish goals for the congregation. Discussion included adding on to the church and school. Mrs. LuAnn Kaaz became the full-time Minister of Music for the church and school. In 2000 a “Harvest Time Leadership Team” began work on fundraising for a building program. On June 18 Rev. Rory Seeger was ordained and installed as associate pastor. In August the old parsonage/teacherage was demolished, replaced by a house on North Main donated to the congregation by the Voges family to serve as the parsonage. In August of 2000 Rev. Schultz suffered a serious head injury in a fall in front of school. Airlifted to a St. Louis hospital, he underwent surgery and many months of therapy before being called into eternal life on February 10, 2001. His funeral service filled both the sanctuary and the new Fellowship Hall as many St. John’s members, community residents and fellow pastors were in attendance. In the fall of 2001 Mary Gross retired as church secretary after 34 years of service to St. John’s. She was replaced by Julie Ratz. Rev. Russell Koen of Otto, Missouri was installed as pastor on December 16, 2001. A gift to the congregation from the Theodore Guebert Estate eliminated the congregation’s operating debt of $53,300. A new organ was installed during that summer. The church was remodeled with a gift from the Henry and Ethel Rahn Estate. The communion rail was brought down to the main floor and the doors in the entryway were removed. Painting and flooring were replaced. Saturday evening services began in April. The old parsonage across the street from the school was sold. In 2003 Ken Williams and Ken Ruwald became the church custodians replacing Glenn and Denise Guebert. A new garage was built behind the new parsonage. The first “Road to Bethlehem” pageant was held in December. The year ended with enough contributions to eliminate the operating debt of $88,000. In 1995 the 8th grade class took a trip to Washington DC, a practice which continues. In 1996 Principal Deitt Schneider’s 20 years of teaching ministry were celebrated. In 1998 the congregation honored Mr. Ron Snyder on this retirement after 43 years of teaching, all at St. John’s. In 2001 an addition was made to the school of three early childhood classrooms, restrooms, library, additional offices, parking lot and new windows throughout the building. In 2000 Chris Burmester replaced Robert Kaestner as school custodian. She was replaced by Loren Harms in 2002. Vernitta Wolter joined Viola Muench as school cooks. Lisa Kloepper continued her service as school secretary. Those who joined our school staff during these years were Alice Kastens, Connie Steffens, Rebekah Schneider, William Becker, Ray Kaaz, LuAnn Kaaz (music), Amanda Wolff, Ryan Devall, Jill Salger, Pam Henry, Cathy Harms, Lois Mesnarich (art) and Lauri Koen. Daycare began in January of 2002. The staff included Jessica Seders, Pam Stellhorn, Sara Heller, Amanda Falkenhain, and Delana Whelan. St. John’s celebrated 150 years of Christian ministry in 2005 with a wonderful booklet full of history in words and pictures that included a pictorial directory of membership. Darlene Letcher joined the teaching staff during that spring. St. John’s entered into the Field Education Program of Concordia Seminary in St. Louis. In May of 2006 Rev. Rory Seeger resigned as pastor to return to his previous career working with Boeing in the state of Washington. Pastor Koen was assisted by St. John’s member, Rev. Armand Mueller (retired from Trinity, Prairie) during this time. Recent graduates Michelle Hines (Concordia-Chicago) and Doreen Bergelin (now Schnepel) (Concordia-Wisconsin), joined the teaching staff in August of 2006. Pastor Mark Nebel of Hoyleton, Illinois accepted St. John’s call as Senior Pastor and was installed on July 1, 2007. Lisa Kloepper (secretary) and Viola Muench (cook) retired after many years of faithful service to St. John’s. They were honored with a potluck luncheon in August of 2007. Sarah Kueker became the office secretary to work with Julie Ratz. In 2009 Southwestern Illinois Lutherans for Life was chartered with Jennifer Becker-Roscow as its chair. Music Director LuAnn Kaaz took a similar position at Immanuel Lutheran in Washington, Missouri in the summer of 2008. That December Lindsey Pfanstiel, a graduate of Concordia University Wisconsin, was installed as our Director of Parish Music. Senior Youth counselors during this decade were Cindy Steele, then Pastor Nebel and now Terry and Susie Harms. Bill Becker supervised the Junior Youth until 2014 when Jennifer Roscow and Lisa Quinn became counselors. Willie and Linda Guebert replaced Ken Ruwald to work with Ken Williams as church custodians. Lynn Loehr and Marilyn Oettle served at school as cooks. Jill Gross replaced Lynn as head cook in 2009. Alice Kastens retired as 4th grade teacher in 2011. She was honored with a dinner. Justin Palm of Trinity, Centralia, joined our teaching staff. Increasing need for daycare rooms necessitated moving the kindergarten classroom to the main hallway. This meant changing the computer and science labs back into a classroom. In 2012 a large Kindergarten class needed another teacher and room. Stephanie Valleroy was hired and a portion of the library became a classroom. In 2014 another large Kindergarten class needed a second teacher. Stephanie took that class and Cindy Nebel was called to teach second grade. The library had to be moved into the office reception area. The remaining staff includes Principal Deitt Schneider and teachers Bill Becker, Lauri Koen, Rebekah Liefer, Rachel Miller, Betty Schmitz and Cindy Steele. Loren Harms continued as custodian. Delana Whelan and Amanda Falkenhain were daycare directors during this decade. Pam Stellhorn and Kellie Shields served as their assistants. A Capital Campaign, chaired by Kevin Liefer, began in the fall of 2013 to raise money for church improvements and school expansion. With much hard work, the efforts of many volunteers, home gatherings and meetings at church and school, 2.4 million dollars were pledged for the project. Remodeling began at church after Easter in 2014. This required the congregation to worship in the Fellowship Hall for two months. Walls were painted, new flooring installed, pews and chancel furniture refinished, changes were made to the lighting and improvements to sound and video systems. Church bells were automated. During that summer an addition was constructed to the daycare wing of the school adding three classrooms with restrooms, storage, laundry space and a new playground. This was the first stage in an expansion project that would continue after school ended in the spring of 2015.